HFR: You have a profession that many children grow up dreaming to have: being a pilot. How did you get to where you are professionally? Dwight Albers: I too was one of those kids that looked up at an airplane and dreamt that I would like to fly one myself. I grew up in South Florida, not far from a small airport that had a lot of small airplane traffic. Even at a young age, I stopped to look up every time an airplane would fly over. I would often dash outside to get a look if it sounded like some unusual, unfamiliar or hi-performance plane passing nearby. About age 10, my mom believed I needed some culture and sophistication, and determined piano lessons were the best means to accomplish that. I had absolutely no interest in playing piano. But I quickly honed into the fact that my piano teacher was a pilot and owned one of those small planes I watched frequently. Some weeks later, he offered to take me and my dad for a ride. He put me in the front seat with him, and after takeoff we leveled off flying along the beach. He handed over the controls to me and gave me a few instructions as to how to keep the airplane level and headed in the direction we were flying. I consider that experience a watershed moment in fixing in my mind what I wanted to do when I grew up. I was a bit young to act upon that interest at that very time, but even benefited from a neighbor who gave me a pilot study guide. A student pilot is allowed to make his first solo flight once he or she turns 16. I began to take flying lessons shortly before my 16th birthday, hoping to be prepared to solo on that birthday. I missed it by a couple of days due to bad weather. I then continued my training so that I could take an FAA checkride on my 17th birthday to earn my Private Pilot’s License. I must include that this was only possible because of supportive parents who were willing to gauge the seriousness of my dream, and recognize that I was applying myself in a way that it was not just a fleeting hobby or interest. Over the next 18 months, I continued to work on additional qualifications and experience earning an Instrument Rating, Multi-Engine Rating, and Commercial License after I turned 18. I then went to college at Embry-Riddle Aeronautical University in Daytona Beach, Florida. E-RAU is the most widely recognized aviation training university worldwide. During college, I earned additional Flight Instructor certifications and gave flight instruction to other students. I ultimately earned a B.S. in Aeronautical Science. After college, I went to work flying small aircraft doing anything from flying charter passengers, hauling freight, medical transport, aerial photographers to wildlife surveyors. In 1984 I was fortunate to have a connection that was able to recommend me for a position at Continental Airlines. A few weeks later, I was hired as a Flight Engineer on a B-727, and began only days after my 22nd birthday. In fairly quick progression, I moved to First Officer on the B-727 and then to Captain on the B-727 when I was 25. Since that time I have flown as Captain on the DC-9, B-737, and currently on the B-787 Dreamliner. Also during this time I served nearly 10 years as Line Check Airman, supervising pilots in their first hands-on experience with an airplane that is new to them upon completion of their simulator training. I also spent several years teaching Captain Leadership and facilitating Human Factors training. In 2010, Continental Airlines merged with United Airlines. In February 2014, I will begin my 31st year with the combined airline. I have always tried to remain humble about my accomplishments and status. I recognize that none of it would have been possible without a piano teacher, my parents, a friend who recommended me and some very lucky timing. Timing is critical, because in the airline industry advancement is based upon seniority. You can’t get ahead by being a ‘better’ pilot, or cozying up to your boss. Many were more qualified than I when they were hired, but are ‘junior’ to me due to being hired after I was. HFR: How important do you feel healthy lifestyle is in your profession? 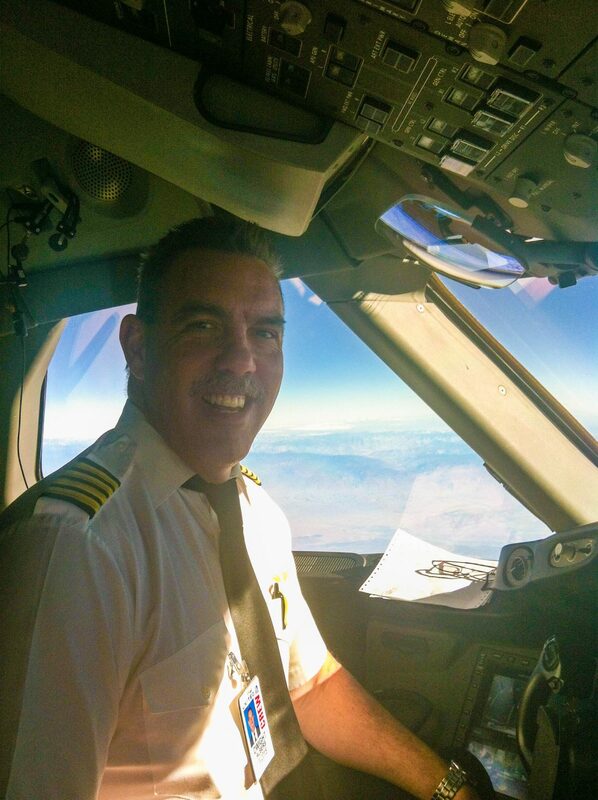 Dwight Albers: Health is paramount for an airline pilot for a number of reasons. Before a student can even get a Student Pilot’s License, he or she must submit to an FAA designated Flight Surgeon for an exam. As levels of pilot responsibility increase, the specifics of the exam and its frequency are increased. But beyond that, the professional pilot can expect to have duty days as long as 18 hours. Basic fitness and fundamental physical endurance are critical. General fatigue has a direct correlation to physical fitness. The better fit an individual is, the onset of fatigue is likely to be delayed compared to a generally unhealthy person. One’s ability to think, reason, and make sound decisions is also directly correlated to one’s alertness and fatigue level. So at the end of that 14 or 16 or 18 hour day, when an operational situation deteriorates and demands expert analysis and decision making, the state of physical health and fitness of the crew could be a factor in determining the safe outcome of a flight. HFR: What is the hardest aspect of being healthy while traveling the world? How do you try and overcome it? Dwight Albers: There are several challenges in remaining fit, rested, and healthy while traveling. The first is that the job itself is very sedentary when actually in flight. There is limited opportunity to stand up, stretch, move about while serving as a pilot. Our departures from the cockpit are limited to operational or physiological requirements. Long haul flying can be as long as 16+ hours, and there is very little opportunity for any form of meaningful exercise during that time. Stretching or the use of easily portable devices such as resistance bands are about the only options an on duty pilot has. Secondly, it is more difficult to be selective about one’s diet when on the road. If you are away from home more than a day, it is not practical to try to carry with you fresh food that requires refrigeration. Once in flight, you are limited to eating what is available on board. Although meals are boarded for crewmembers on longer flights, management’s idea of a “nutritious meal” is more akin to a UNICEF distribution than what an average, active, healthy man would choose. But you can’t work for 12 hours without eating, so often you eat what is available. Thirdly, the fatigue of long duty days, the rigors of being as many as 12 time zones away from your natural body time, and variable accommodations all make for getting proper rest difficult. Everyone’s body clock is different, so you have to determine for yourself when you can best rest and plan your activity and sleep so that you can begin your next duty day well rested. HFR: What is your fitness routine while on the road? Dwight Albers: On the road, most of the layovers that my schedule has are at least 18 hours in length, and often 24+ hours. That affords plenty of time to get rested, nourished, and have time to seek out a gym in or around the hotel where I stay. One of the first things I do if at a new layover hotel is inquire about the hotel’s gym, and/or nearby commercial gyms. Some hotels have very nice gyms, but most are marginal at best. Some hotels have guest privileges at nearby gyms, or offer discounted passes. Rarely does a layover of 18 or more hours pass without a trip to the gym. I have learned to make the best of the facilities available and modify my workout to take best advantage of the equipment available. I also carry protein bars and shakes with me to supplement my regular meals. HFR: Tell us your favorite part of your job and your least favorite part of your job. Dwight Albers: Probably the least favorite is tolerating the infinite amount of corporate drivel that one has to deal with. Through two corporate bankruptcies, 4 mergers and acquisitions, I cannot even begin to count or remember all of the CEO’s in 30 years. I just want to fly airplanes. I don’t really care about their politically correct sensitivity training, what I can and can’t post on Facebook, or why corporate America seems compelled to sponsor a gay pride parade, when during the last contract negotiation they cried that they couldn’t spare another dime to pay us. Also, because this is such a highly regulated business, as pilots in particular we are always under the microscope. We are always only one mistake away from having our license suspended or revoked. We are watched and listened to continuously. The oft-far reaching knee jerk reaction from the FAA, Congress, or the corporate culture makes us jump through hoops just to comply with some guideline that little or no relation to operating a safe flight on any given day. Unfortunately I don’t believe this in general is confined to this industry. Anyone in any industry for a career will likely tell you that they long for the simpler days- that the job has gotten more difficult- not easier. When you cut through all of the previous frustrations, distractions, and things that disgust you or outright make you mad, once you have your takeoff clearance, you line up on the runway, you push the throttles up and accelerate until you’re airborne, all of those other things you leave behind you. For the time being, I still experience the thrill of flying. That is the fun part, and my favorite part, and probably always will be. It is wonderful having a different view from your ‘office’ every day. There are views and perspectives that are unique- seeing Mt. McKinley, a sunrise over the Atlantic or Pacific, seeing the curvature of the earth, or seeing a meteorite or rocket launch from 41,000′ is truly a spectacular experience. Perhaps a third category is the things you find most rewarding. 49 of 50 flights are uneventful and as routine as getting in your car and driving across town. But ever so often, you appreciate the skills and experience that you have accumulated as you have to use those tools to make the best of an unfavorable situation. It may be an issue with a failed component of the aircraft that forces you to return to the gate or forces you to evaluate a diversion short of your destination. It may be a deteriorating weather situation, and you have to decide to press ahead, detour, or return to your origin. When you get to pull out of your ‘toolbag’ those tools that you only occasionally use, and use them to resolve a situation favorably, it is quite rewarding. I have always agreed that an airline pilot earns his annual salary in just 3 or 4 days of the year, when the chips are down, and all 200+ passengers on board are depending upon you to make the right decision and choosing the safest course of action, even if it is not the most convenient. It is rewarding to get thanks and kudos from passengers who are happy you decided what you did, even if it means they are stopping short of their destination that night. HFR: After traveling so much, what are some tips you have for our readers? If you are traveling long distances around the globe, travel westbound if at all possible- it is much easier on your body clock than eastbound and you will adjust and recover much faster. The atmosphere on a airliner in flight is 10% or less humidity. The more hours you spend, the more you will dehydrate. Drink lots of liquids. Dehydration can lead to fatigue, aggravate other conditions, and cause kidney stones. Deep Vein Thrombosis can occur from long periods of sitting and motionless posture. It is a formation of blood clots primarily in the legs. Age, fitness, obesity, circulatory problems can all complicate and accelerate this and it can be life threatening. While seated, make an effort to move your legs frequently. Do leg lifts and alternately tighten and relax the muscles in your legs. Stand and walk as often as possible on longer flights. It’s natural for some to have a fear of flying. Do remember that commercial air travel is the safest form of travel on the earth. If you have questions, and see a flight crewmember waiting at a gate, or greeting passengers on the aircraft, feel free to ask questions. Most of us enjoy taking a moment to answer a question and reassure you about your travels. HFR: Any funny and/or interesting story to share?Dwight Albers: Fortunately, the few stories I share are not overwhelmingly sensational or hair raising as some people ask, and I prefer to keep it that way. Some pilots seem to claim bragging rights by the volume or severity of the incidents they have experienced. Either they are very unlucky, or have made very poor decisions or both, and I’d prefer to keep my distance from them. Unfortunately for all of us in life, luck does play a part. They say a pilot starts his career with an empty bag of experience and a full bag of luck. The key is to filling your bag of experience before emptying your bag of luck. The older I get, the “more scared I get”, so I try to avoid drama and keep myself out of situations that could turn out badly. I think when you get really old they call that wisdom. I think I have been fairly lucky having accumulated nearly 24,000 flight hours and not a single engine failure or necessity to shut an engine down in flight, nor any catastrophic mechanical failure. Aircraft of the 21st century are amazingly reliable. Probably the most startling moment some 20+ years ago was in a DC-9. We were at altitude, and one of the windshield panels in front of me developed a crack. Aircraft windshields are a inch or more thick and made up of multiple layers of glass and flexible plexiglass designed for strength and resistance to bird strikes. So a crack of a single pane is almost never cause for an emergency. Procedures in the event of a cracked window call for the heating element to be turned off. I was intrigued in the crack pattern and was leaning forward examining it. Meanwhile, the glass panel was cooling quickly with the -50F air outside. As it quickly cooled, I jumped at the concussion of what sounded like a shotgun going off at close range. The rapid cooling had caused the entire glass pane to shatter in place with a bang. The structure of the window remained intact, but for a moment I thought that even with a seatbelt on, I was headed out of a blown out window! After I stopped hyperventilating, the flight continued uneventfully other than the necessity of the First Officer to land the airplane, as I could no longer see through my windshield. A few years later, I was again flying the B-727. I was flying a segment from Cleveland back to Houston. Upon arrival in Houston, I was informed through a series of relays from service personnel, that I had a “stowaway” on board. What did that mean? A stowaway? I dog, a cat, a wild animal of some kind? Airport security was such that it was highly unlikely that anyone could have snuck onto an airport and hidden in an aircraft waiting to depart. Soon I learned that it was one of the baggage handlers from Cleveland. Apparently he was in the far end of the baggage compartment arranging bags and cargo, when his buddies on the ground thought the plane was fully loaded and closed the cargo door. He banged on the door, but with all of the ambient noise of an airport, and the thick structure of the airplane, no one heard him. There is no internal door release, so he was stuck. Cargo compartments are pressurized and most often heated as well. So other than the fact that he didn’t have a movie and a free drink, he was probably more comfortable than most of the people in the coach section. I followed him to the supervisors office where he promptly phoned his boss in Cleveland to confirm that he did not leave work early and that he was still clocked in. A couple of years ago I was repositioning a B-737 from Boeing Field in Seattle to Seattle-Tacoma International Airport, following a major league baseball charter. The two airports are a whopping total of 4.6 miles from center of airport to center of airport. Thus the two runway ends are not much more than 3 miles apart. In what likely is the shortest (successful) airline flight on record, we took off, climbed to 1200′, and immediately configured for landing on a flight that lasted less than 90 seconds. Finally once in a great while, a passenger may develop a medical condition that requires treatment from a doctor. All aircraft carry emergency medical kits onboard that can be used by a medical professional to assess or treat someone who needs attention before the aircraft can land. Once in a great while, an emergency develops when a patient needs medical treatment at the first available opportunity and it becomes necessary to divert the aircraft short of its destination. Airlines also contract with a physician’s consulting service who can make additional assessments, and if necessary coordinate with the airline’s flight dispatchers to determine the best location for treatment. Recently on a transatlantic flight from Africa to Houston, I was advised about a passenger who was in distress. His condition had been ongoing now a number of hours and the cabin crew wanted to involve our consulting physicians via satellite phone. At the time, we were still about 3 hours east of Miami. They concluded that the patient would be in grave danger if we continued to Houston. Miami was the nearest suitable diversion point, so we requested an expedited routing and for medical personnel to be standing by upon our arrival. It is not unheard of for a passenger to encounter a heart attack, seizure, difficulty breathing or some other condition deemed urgent enough to divert an aircraft. You ask- well what was the condition? Well Jay Leno jokes about it and Jimmy Fallon jokes about it, and Saturday Night Live does skits poking fun at it. But when a male “has an erection lasting more than 4 hours”, medically known as a priapism it is truly a medical problem. And as we were advised by the consulting physicians, it can be life threatening if lasting more than 12 hours. I may be the first pilot to divert a widebody international flight for that and I hope I am the last as well! HFR: You are a very active, social, and positive man: how do you feel that this positively affects your life? Dwight Albers: My dad was the one who taught me the importance of being an optimist. I’d rather be disappointed from time to time, rather than going through life feeling “woe to me” and wondering if around every corner was the next disaster. I have had my share of challenges through life, but I avoid letting my failures define me. They say it takes far fewer facial muscles to smile than it does to frown. I find much more contentment in life smiling at circumstances and at those whose path I cross. A smile is a natural human reaction to another smile. I have confirmed that with our 8-week old granddaughter. A smiling face is so much easier to look at, and I’d rather look at a returned smile than a scowl or a look as though I have a 3rd eye on my forehead. One of two things is going to happen to every pilot, and neither one of them is good- Either one day you will land and walk away from the airplane not knowing that was your last flight, or one day you will walk away from the airplane knowing that it was your last flight…I’m hoping for the latter, but still not looking forward to mandatory retirement age.